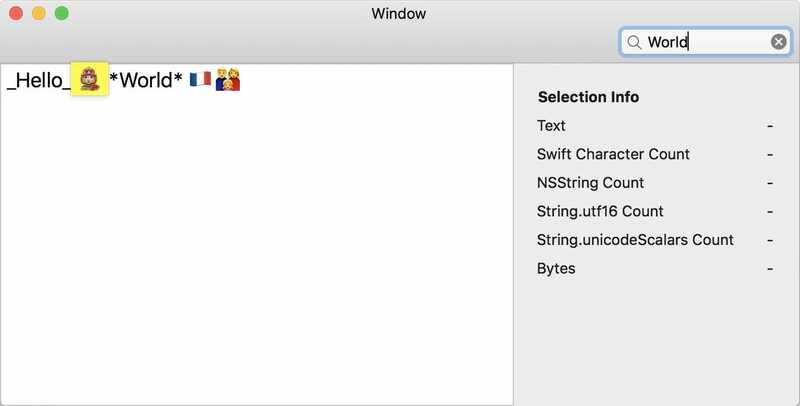 00:06 We're still on the topic of Swift strings, and today we'll be looking at issues you may encounter when working with both String and NSString. If you use text APIs from AppKit and Foundation, you have to deal with both string types, and there are some tricky differences to be aware of. 00:28 We'll use a small example app to play with strings and ranges within strings. 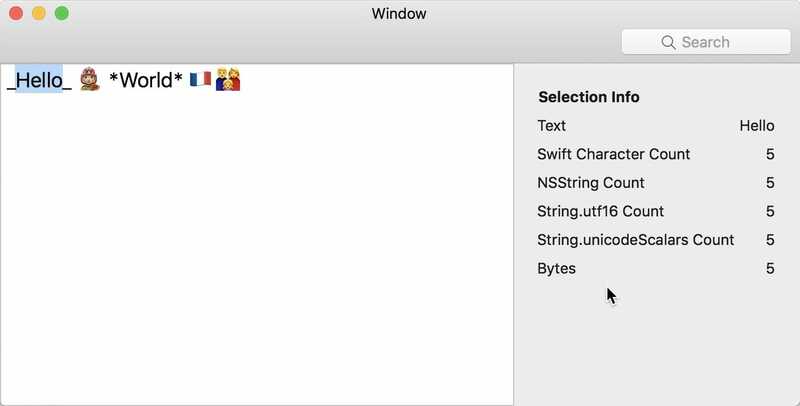 The first thing we want to look at are the differences between ranges of Swift strings and NSStrings. 02:31 We run the app and see that it works: after entering "Hello" in the search field, the word "Hello" flashes in the text view. It also does this if "World" is entered. 04:09 This code compiles, but it's wrong. We might not notice at first, because if we search for "Hello," the correct word flashes, but if we search for "World," the first emoji is highlighted! 04:26 Swift strings and NSStrings have different concepts of what a character is; we can't convert a Range to an NSRange by simply counting indices, because they have a different index type. The female firefighter emoji with a skin tone modifier may look like a single character, but it isn't for an NSString. 05:48 We revert back to the correct code and move on to the second feature of our app. let range = Range(nsRange, in: text)! 07:13 We can run the app and check that the correct text shows up as the selection. Again, it's important to use the right range conversion initializer, because otherwise we'd have the same problem as before, but this time in the other direction: from NSRange to Range. 09:02 The Swift string's unicodeScalars view returns a count of four. You can look up online what the elements of a Unicode character are. In this case, the firefighter emoji character is composed of "woman," a skin tone modifier, a zero-width joiner, and "fire engine" — four scalars in total. 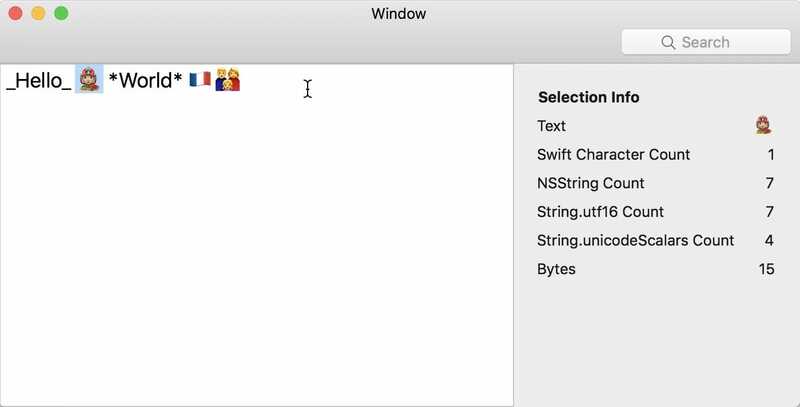 10:35 The French flag emoji 🇫🇷 is listed as one Swift string character, four NSString characters, and two Unicode scalars (special flag versions of "F" and "R"). Looking at all these different counts, it makes sense that mixing up ranges and indices doesn't work. You can get away with using Range and NSRange interchangeably if you're only dealing with simple letter characters. But as soon as you come across a more complex character, like an emoji, the following indices will be different in the various string views. 11:35 Family characters are interesting as well. The emoji we used, 👨‍👩‍👧, is composed of three scalars for the individual people, plus two zero-width joiners to combine them into one family: five scalars in total. 11:58 We have to be careful when operating on the raw data of a string, because we might be changing the byte of a single family member and inadvertently changing the entire family character. It's safer to operate on whole characters than it is to operate on individual bytes or scalars. Luckily, the two initializers we saw today, which convert from Range to NSRange and back, make things a lot easier.